What is Black Bowmore Worth? No whisky better epitomises the current market bubble than Black Bowmore. Distilled on the 5th November 1964 in first fill sherry casks, Black Bowmore has become THE most sought after Islay whisky and ranks high amongst the best selling single malt whiskies. Below are the original release details which show the leap in RRP (recommended retail price) at time of release jump from £80 per bottle to £16,000 per bottle. There are many within the industry (including ourselves) that believe the market cannot sustain the exponential growth that we have experienced recently. A quick glance at the Rare Whisky 101 Apex 1000 Index to the right shows the rise in value of the single malt market since 2008. Can the near vertical trend continue? With prices at record levels this makes the ideal time to sell your Black Bowmore whisky and we are here to help and ensure you get the best deal. We can advise the value of your Black Bowmore whisky and help you find the best place to sell it. 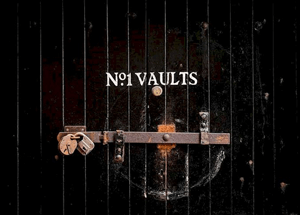 The No.1 Vaults at Bowmore – the oldest single malt whisky maturing warehouse still surviving. This is where all of the Black Bowmore casks were matured. Did you know that the first single malt to be marketed with in the UK was Glenfiddich in 1963! How the market has changed. But we need not go back to 1963 to realise what a change the single malt whisky market has gone through. 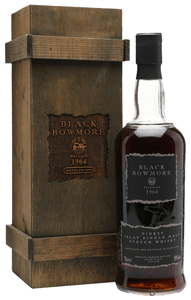 Black Bowmore was first released in 1993 at £80 per bottle, well before the market boom. The near black whisky (which takes its colour from the sherry casks) was considered expensive at the time of release, but this was at a time when the whisky itself (rather than the distiller) was front and centre. 2007 generally marks the start of the specialist whisky auctions. This coincides with the huge rise in marketing budgets by the distillers and the rise of a new form of collector; the investor. 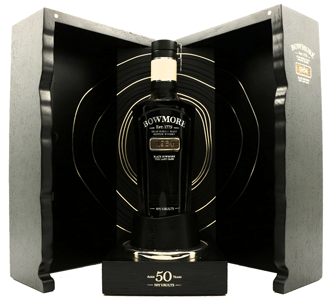 The fourth edition of Black Bowmore was released in this year too, at a cost of £2,400 per bottle. The final edition of Black Bowmore shows the epic transformation of the market – being released at a whopping £16,000 per bottle. Was it worth this price? Critics widely cite the first three editions as being superior. We all know the angels take their fair share of spirit from the casks (2% per year). However, true to the more grounded visions of the distillery in the early 1990’s, bottle seals were not necessarily the best. Sadly many of the early Black Bowmore editions suffer from evaporation as a result. The reduced levels affects the value as the reduced alcohol level (as it is this which evaporates first as it is more volatile than water) has a big impact on the taste. We strongly recommend sealing your bottles using Parafilm strips; medical grade sealing tape which will stop any more evaporation. They are available here. If you no longer have the original wooden box that came with your bottle you may well have lost thousands of pounds. Collectors pay the highest prices for bottles with their original boxes, some not even considering a bottle devoid of its original case. The box for the final edition of Black Bowmore was hand crafted by carpenters and took 70 hours each to make. Where it all began. The first edition of Black Bowmore from 1993. 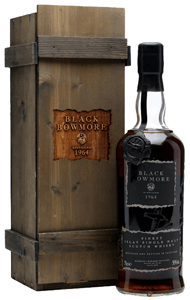 A Black Bowmore third edition – is it worth £5,000 or £15,000? Actually, it can be worth both. Demand for Black Bowmore is huge. We have clients across the UK and Far East looking for bottles. However, as noted above the market is volatile. The results from auctions can be startling. One month a third edition might sell for £5,000, the next month another third edition will sell for £8,000 – with the same auction house! The level makes a big difference, but so does confidence in the market and the whims of collectors. Below are the original release details which show the leap in RRP (recommended retail price) at time of release jump from £80 per bottle to £16,000 per bottle. There are many within the industry (including ourselves) that believe the market cannot sustain the exponential growth that we have experienced recently. 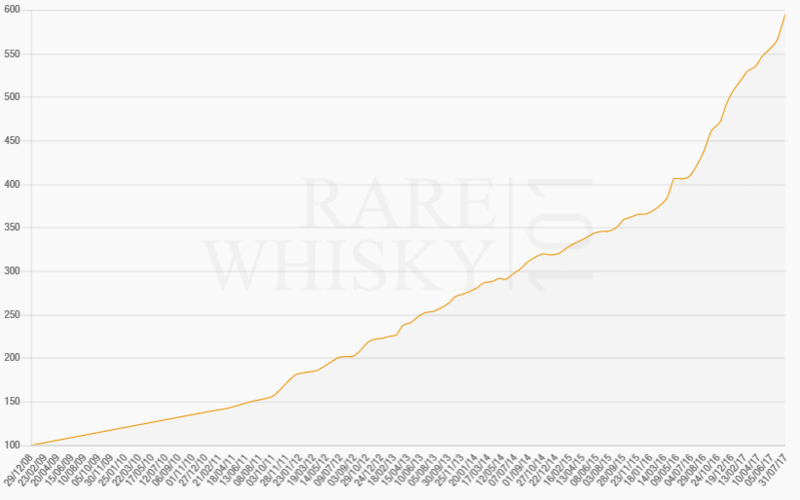 A quick glance at the Rare Whisky 101 Apex 1000 Index shows the rise in value of the single malt market since 2008. Can the near vertical trend continue? If you would like a free, no obligation valuation of your Macallan please use the form below. You can also email details about your bottle to [email protected] or call us on 01270 440357.